Frugal parents are faced with a common dilemma. Spending too much on your children is unwise and can lead to spoiling them, but depriving them isn’t the best way to go, either. So where are parents supposed to draw the line to avoid ending up with an empty bank account? It’s only natural to want to give your children the best. I’m always astounded by how other parents spoil their kids, and yet, when I think of my sweet girls, I can’t help but want to buy them everything. When it comes to spending money on children, I think quality is a key factor to keep in mind. Don’t bother spending a lot of money on toys, especially if it’s just a phase or a hobby. Don’t spend a lot of money on clothes or school items, either. Children grow quickly and their interests and hobbies can change just as quickly. I love buying my daughter’s toys used because then I don’t feel bad about reselling them if she doesn’t use them. For example, I thought my daughter would be into Little People, but it turns out she’d rather build towers and dragons with her Legos and Duplos. I don’t have to fret over spending too much money on toys that go untouched because I spent only a few dollars on them. I also try not to spend a lot of money for birthday and Christmas gifts for my kids. They already get so much stuff from others, it just doesn’t make sense to spend a lot on these occasions. Perhaps when they get older, they’ll get a special gift each year from us. For now, we’ll pocket the money. On the other hand, I think it’s a good idea to splurge on experiences. My parents bought my sister and I almost any toy or piece of clothing we wanted, but we never actually did anything as a family or go on vacations. When your child is grown, what are they going to be hanging onto – the toy they begged for years ago, or the memories from that fun, family vacation? When time and money are tight, it can be hard to even think of a family vacation. However, if you cut back your spending where your children are concerned, you’d be able to spend it on memories that matter. Limit how much stuff you buy them for birthdays and holidays, and instead explain to them that the money is going in the family vacation fund. Or perhaps instead of a birthday party, take your child on a special one-on-one date. Let your child spend the day with dad doing laser tag and go-karts, or have them spend the day with mom at the park. These are less expensive than a party and presents, but have more of an impact. When it comes down to it, take a look at what your child has. If they have more stuff than memories with you, then maybe it’s time to rethink your spending. Splurge meaningfully, and spend consciously. 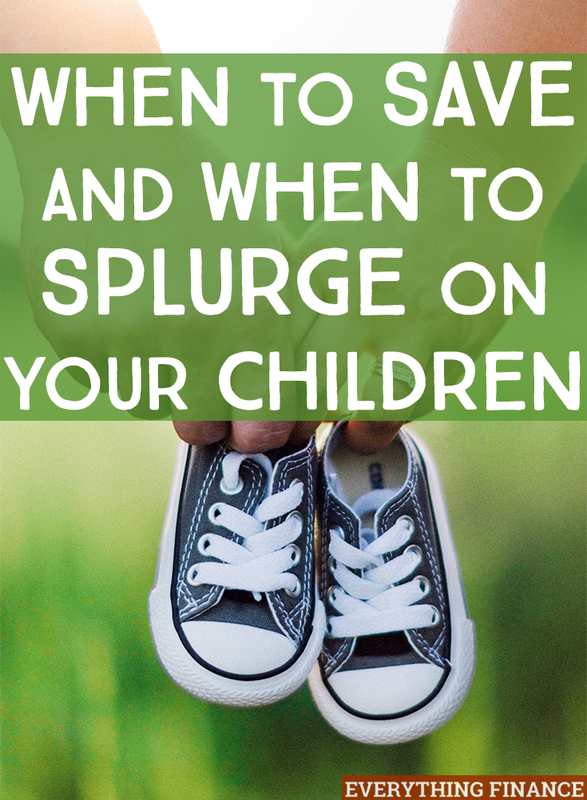 When do you like to save and splurge on your kids? Is it okay to hire a cleaning lady when you have debt?